I love to travel. I mean who doesn't right? Experiencing new places is amazing. One of my favorite things to do while traveling is to go shopping. Growing up I was guilty of buying some crazy touristy things like t-shirts, shot glasses (I thought they were just tiny glass cups), and snow globes, but as I grew up my tastes matured. For the past 10 years or so I have really tried to buy cool stuff that is useful. That may sound obvious but it's not always easy to find beautiful and functional things that also represent where you traveled. In my next post I am going to show some of the odds and ends I've gotten on my travels but this post is solely about my "collection." Do you have a collection? I never was much of a collector. Sure I bought a lot of CDs (before digital music) and DVDs (before digital movies) and books (before digital books...hmm, trend?) but not really much else. Some people collect certain things when they vacation. My mom always buys a magnet from where she travels and my youngest brother always get a t-shirt, but I never really got into just one thing. That is until I went London in 2008. While I was there shopping in Covent Garden I found a beautiful pencil drawing of London Bridge. This started my love affair with pencil drawings. How mean seriously, how cool is this drawing? I don't remember exactly how much I paid for it but I think it was around 30 pounds (can't figure out how to add that symbol), so about $60. It was expensive but it came framed and matted so I thought it was worth it. 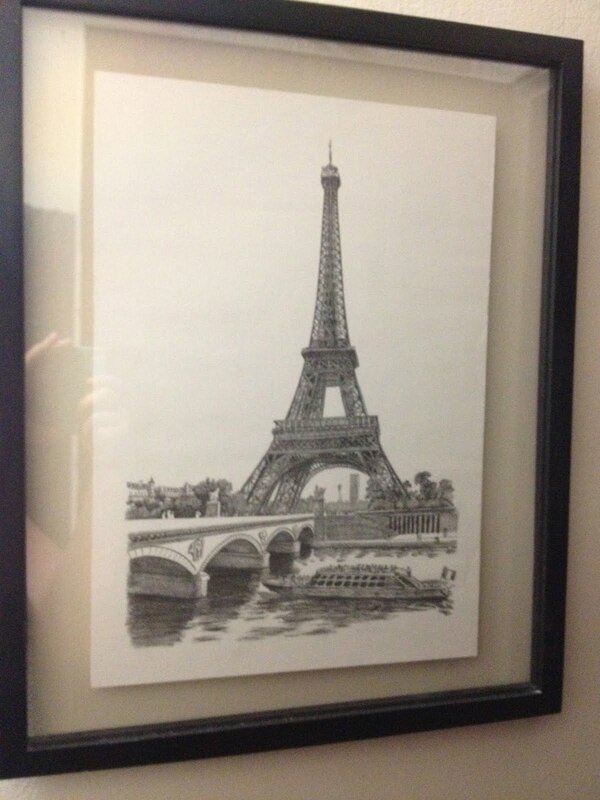 The next week when I was in Paris I happened across a street artist who was selling pencil drawings and I thought... This is it! This is the collection I want to start. 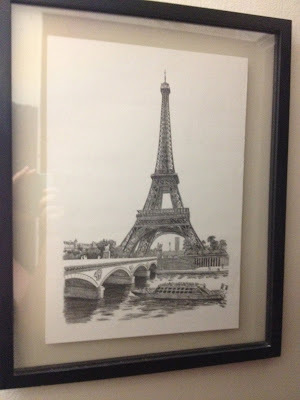 So I bought an awesome pencil drawing of Paris for only $20! The artist was very kind and took American dollars because I was out of Euros. It is a pretty large picture and did not come framed but I put it in a floating frame when I got back. My collection only consisted of those two drawings for a couple of years until I went to New Orleans for a conference in February. I was walking around Jackson Square where all the artists showcase their work and I saw a guy who did pen drawings. Not exactly a pencil drawing but pretty stinkin' close. 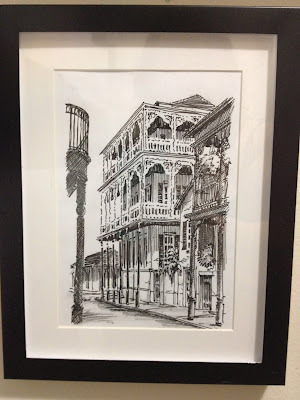 I chose a small 5x7 drawing of a mansion in the French Quarter. I like it because it really evokes the feel of that area with the iron work and hanging plants. I think this drawing was about $20 or $25. I've collected all my drawings into one space, the bathroom. Maybe it's a weird place to assemble a collection but I think they look good in there with the gray and white/off-white tones. I've been "collecting" for the last four years and I only have three pieces to show for it but it's not for lack of trying. Most recently I was in Mexico and I was really excited to find another piece for my collection... but no such luck. I looked all over for a pencil or pen drawing (I was really hoping for one of the Mayan ruins) but I found nothing. I did buy two things which I'll share tomorrow. My collection may still be in the beginning stages but I have the rest of my life to travel to new places and find cool drawings.